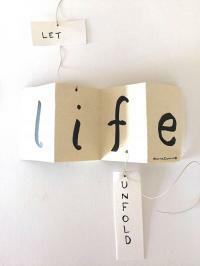 Life rarely unfolds exactly as we want it to. And if we stop and think about it, that makes perfect sense. The scope of life is universal, and the fact that we are not actually in control of life’s events should be self-evident. The Universe has been around for 13.8 billion years, and the processes that determine the flow of life around us did not begin when we were born, nor will they end when we die. What manifests in front of us at any given moment is actually something truly extraordinary—it is the end-result of all the forces that have been interacting together for billions of years. We are not responsible for even the tiniest fraction of what is manifesting around us. Nonetheless, we walk around constantly trying to control and determine what will happen in our lives. No wonder there’s so much tension, anxiety, and fear. Each of us actually believes that things should be the way we want them, instead of being the natural result of all the forces of creation. Every day, we give precedence to our mind’s thoughts over the reality unfolding before us. We regularly say things like, “It better not rain today because I’m going camping” or “I better get that raise because I really need the money.” Notice that these bold claims about what should and shouldn’t be happening are not based on scientific evidence; they’re based solely on personal preferences made up in our minds. Without realizing it, we do this with everything in our lives—it's as though we actually believe that the world around us is supposed to manifest in accordance to our own likes and dislikes. If it doesn’t, surely something is very wrong. This is an extremely difficult way to live, and it is the reason we feel that we are always struggling with life. Nonetheless, it is also true that we are not powerless in the face of the events unfolding around us. We have been gifted with the power of will. From deep inside, we can determine how we want something to be and apply the power of our minds, hearts, and bodies in an attempt to make the outside world conform. But this puts us in a constant battle of our way versus the way it would be without our intervention. This battle between individual will and the reality of life unfolding around us ends up consuming our lives. When we win this battle, we are happy and relaxed; when we don’t, we are disturbed and stressed. Since most of us only feel good when things are going our way, we are constantly attempting to control everything in our lives. The question is, does it have to be this way? There is so much evidence that life does quite well on its own. The planets stay in orbit, tiny seeds grow into giant trees, weather patterns have kept forests across the globe watered for millions of years, and a single fertilized cell grows into a beautiful baby. We are not doing any of these things as conscious acts of will; they are all being done by the incomprehensible perfection of life itself. All these amazing events, and countless more, are being carried out by forces of life that have been around for billions of years—the very same forces of life that we are consciously pitting our will against on a daily basis. If the natural unfolding of the process of life can create and take care of the entire universe, is it really reasonable for us to assume that nothing good will happen unless we force it to? For lack of a better name, I have called this the Surrender Experiment. Michael Singer is the author of Unthered Soul and above excerpt is from his upcoming book, The Surrender Experiment. Seed questions for reflection: What does the "surrender experiment" mean to you? Can you share a personal experience of a time you consciously decided to surrender instead of trying to control your environment? What practice helps you develop awareness of the natural forces of life and harmonize with it? Any practice that can take me out of my critical thinking, analytical, quantitative, judging, competing, status seeking, language mind for awhile and bring me back to what keeps me open, small in the greater scheme of life, and most joy. Connections, focus/flow, nature, yoga, laughter, awe and wonder, unintentional movement, sharing of a good meal with loved ones, engagement, sniff, touch, feel, balance, dive, splash, play, or just sit without outcome and observe without time keeping, naming, agenda making, etc. Whatever I can participate in that allows the mind not to harden me heartless, cold, and helpless whenever I can and see what I can do. Lovely to ponder on this a while and to see what comes to me from within... God, grant me the serenity to accept the things I cannot change, courage to change the things I can, and the wisdom to know the difference! The entire universe and all the physical entities and events occurring in it in space and time involving matter and energy as perceived by the senses of a human being plus all the abstract entities involving emotions, thoughts, desires, conclusions, and concepts etc. occurring in his or her mind can be summed up and labeled as "Oneness." The true nature of this "Oneness" is unknowable (I believe) whether you are a so called "enlightened" person or not. As such, who is there to surrender and to whom? It s hard for me to grasp the idea behind "surrender experiment." I can tell there is wisdom in this, and yet I wonder if without careful application, it can turn into a sort of passivity about real human problems like racism and climate change. But being an activist driven by desperation and fear is not effective in the long-term, either. There is much to ponder here. When life is going my way it is relatively easy , but when things are not going my way if someone I love is in pain it is very very difficult to just surrender . It is difficult to see their pain , memories of good times come back and there is so much pain , life stops , one cannot enjoy anything anymore , nothing seems to be worth it , there is sadness , there is pain felt in the chest , everything is heavy , there is so much suffering . If I could I would change things , I want to change things , I want to change the situation , I want to dissolve the pain , I want to run away , I want this to go , now . But there is no where to run , to hide . I am tired holding this pain , there is nothing more to do , I surrender , I am in a corner , I have hit the wall , now I surrender . I no longer can lift this burden , but before that I have to burn , I have to burn in my pain , this burning burns away the remaining ego , completely , I am humbled , I am nothing left , only the ashes that remain after the burning is complete . I melt away , I surrender completely . There is nothing I can do now . God , Lord , Divine , Higher presence , I drop the burden in your lap , I drop my resistance to what is , I let go holding this burden , I have burnt enough in the pain now I can no longer carry on . So I let go , I let go because I am tired . I am so tired . I surrender . I suppose all that is, all the unfolding and evolution of the cosmos, is a surrender experiment. The surrender experiment for me can be for me to put aside my trying to steer and control, put aside my goal directedness, let go of my agendas, surrender to what it is that I am experiencing, and see what happens. I've had interactions in which I say what I think, feel, and/or see without trying to control the outcome, and such interactions are more exciting and alive than when I try to control the outcome. What helps me develop awareness of the natural forces of life and harmonize with them is waking up, opening my eyes and seeing, letting go of my expectations and desires, learning to allow and work with what's happening rather than try to control. Dealing with my children helps me to learn to surrender and be responsive to where they're at and not try to impose my will and fight with them. Life is much too big to fight and try to control. I am in harmony with life except for when I fight it. It's easier to accept and allow the harmony. It helps me to reflect and meditate on all this. It helps me to have "Process, not outcome" as a mantra for myself. Hi Michael, I liked your article. It is timely as I am putting the finishing touches on my book Speaking Universal which shows how to tune into the Universal mind before applying will, so that the Universe or person or plant can get ready to receive your conversation or plan to prune (or not:). Sometimes we sense a pulling energy from a person or a pet saying "tend to my needs, I am more important than you" and quite rightly, if you Speak Universal, you will say "no." If you would like me to send a couple of chapters, let me know. All the best, Victoria (Fabling) from the UK. Over the last month or so, I've had interactions with some co-workers that have felt unpleasant to me. It's been triggered by the things they say, how they say them, and then my own reaction to it all. In the moments when these interactions were happening, I was finding myself more caught up in the reactivity than not. Then after I would go home for the day, go for a walk, get some fresh air -- I would see more clearly the reaction I was having to these situations. One day, I considered that my reactivity may be tied to "things not going my way." This person said something I didn't want them to say, or used a tone that I didn't want them to use, or that person didn't do something the way I would have liked. So one day I walked into work and decided that when one of these triggering interactions came up again, I would simply acknowledge to myself, "things aren't going the way I want right now." And I would surrender to that. The day I tried this, I found that even when people were saying and doing the same things, I felt more free and less reactive on the inside. This is still a daily practice for me, and I'm taking baby steps. Also, I want to clarify that I don't think this means we have to be doormats. Sometimes it's important to communicate something clearly and directly, and stand up for something, but I think this can be done more wisely when we're in the right space ourselves. To me, surrendering means surrendering my egoic mind, the mind that is self-centered, possessive, not caring for others that incudes nature-animals, plants, trees, water,earth and sky.I am responsible and accountable for messing things up and doing right to sustain and preserve the creation. How do I employ my energy in creating, sustaining, contributing and serving life is my life mission. When I live this way, I feel I am in harmony with life force. I feel like I am in a dance with the life force. When i receive the grace from nature and people, my heart is filled with joyful gratitude. Such gifts are not measured on a materialistic scale. They are experienced in our hearts and they blossom our hearts. This may sound very simple. It is my knowing that too much "headding" takes away the simple joys of 'hearting". How to have the joyful innocence of a child in an adult body and mind is an interesting challenge. It is like planting a seed and watching it grow with an ever present curiosity. It is like hearing the birds chirping, watching the clouds floating and listening to the inner voice singing on its own.These are the moments of grace and I am blessed to have them coming everyday on their own. My heart is filled with gratefulness. May we keep our hearts open to receive and give gifts coming from everywhere!